A couple of weekends ago, I went a few galleries in Chelsea. 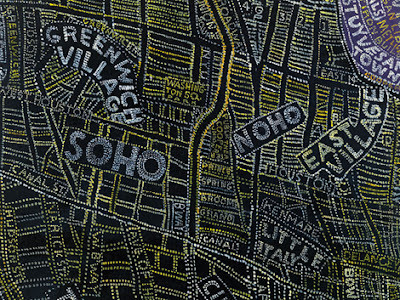 I started with Paula Scher’s Recent Paintings exhibition at the Maya Stendhal Gallery. It was slated to close on January 26; luckily for perpetually late admirers the exhibition has been extended for two more weeks. Scher, a designer of rock star proportions is a partner at Pentagram and is best known for her vibrant posters for the Public Theater and the Citibank logo. Similarly, to those typography-chocked Public posters, Scher’s giant map paintings are completely composed of hand drawn type. The maps, however, do not depict any place. This is Scher’s first solo show as a fine artist and every piece in it is sold. Clearly, less is more.